Paul Breloff from Accion Venture Lab recently wrote a NextBillion post recommending approaches to facilitate “thinking globally” while “innovating locally.” While many businesses strain to reach this goal, the micro-franchise business model accomplishes this concept exactly. Micro-franchising lends the emerged market’s corporate advantage to local, emerging market entrepreneurs – propelling local innovations and adaptation. Jibu, the company my father and I started about a year ago, is in the midst of piloting this model, and we think we may be on to something. So far, we’ve launched four pilots: two in Kampala, one in Kigali, and one in the Democratic Republic of Congo. Each is a separate, local, legal entity but branded and held to the universal quality standards set by Jibu. After paying a franchise fee of $1,000 USD, partners were provided with financing, equipment and the business resources needed to start a Jibu franchise treating, packaging and selling safe water at a controlled price, affordable to the middle 80 percent of the local market. Partners are expected to pay back the capital expenses over the course of three years with a portion of the revenues they generate selling water. 2. Despite it costing us over 6 months up front, our partners in DR Congo have registered Jibu as an NGO (“ONG Uzima”) rather than as an enterprise. As a social enterprise that does generate profit, we did not expect to have the option of being classified as a non-profit entity. But in DRC, an NGO is a legal entity that can sort of fly above a lot of the government stipulations and corruption. In the DRC it is a legal vehicle that is more indicative of its stamp of approval from the king / governor than it is a classification of profitability. This is essential if we want to have any chance of having a successful enterprise in the DRC. Despite how well social enterprise and development sectors recognize the need for “on-the-ground ownership,” it is remarkable how few organizations actually do it. Enterprises tend to give only partial ownership and cling to a company-owned model, whereas development NGOs tend to give away resources/solutions at a nominal cost, which also results in only a partial ownership mentality. As hard as it is to hold the reigns gently, I strongly recommend it. Local ownership has accelerated innovation. Owners invest more, innovate more and initiate more because they know this business is theirs to grow or to sink. There was a clear moment of epiphany for each our partners when this realization sank in, and it has made all the difference. 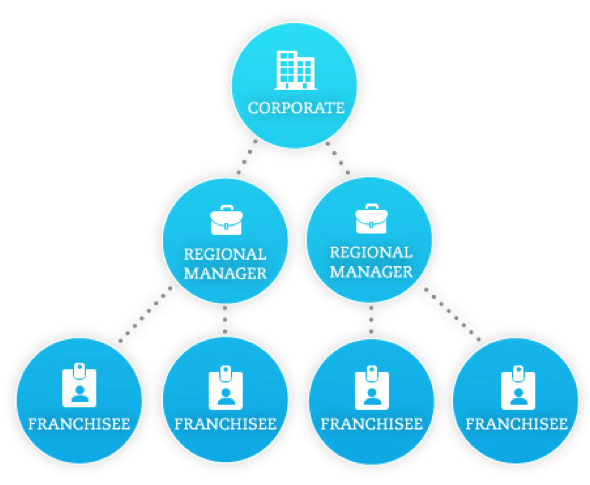 The Jibu micro-franchise is structured as three tiers of operation, the global corporate tier (franchisor), the area regional manager tier (area master franchisor), and the community tier (franchisee). In Jibu’s model, which is a fairly standard one in the franchising sector, the global tier sources water filtration equipment and bottles, develops a brand, sets quality standards, standard operating procedures and in-store processes and provides business guidance and financing. The corporate tier is able to give our partners’ small businesses big business advantages: economies of scale, universal branding, political sway, best practices and operating procedures, quality control, consulting and legal support among others. In this way, we are leveraging not only emerged markets’ capital, but also its expertise to provide a competitive edge for our partners. The regional tier has the capacity to enforce compliance, provide maintenance and grow the total number of franchises. The community tier is the franchisee level. Franchisees own and operate the water depot – they are the business to consumer tier and the frontline of marketing and customer interactions. 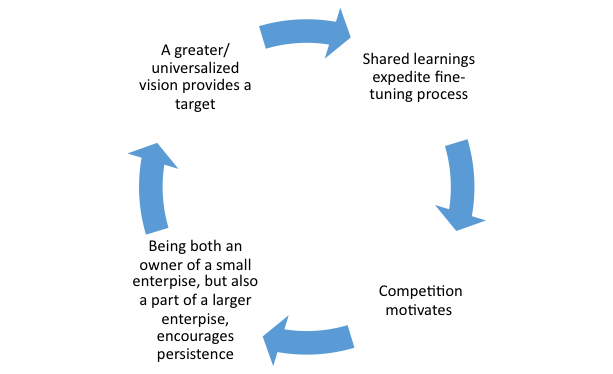 A greater, universalized vision provides a target. Shared lessons expedite the process of fine-tuning. Being an owner, but also a part of a greater network, encourages persistence. 2. Partners’ financial incentives can be aligned to push growth – The global, regional and community tier all have the same financial and social goal – sell water to the middle 80 percent of emerging market. The global tier needs this to be paid back and fulfill charitable charter and the regional and community tiers earn the profits directly. We require that a portion of the profits go into an escrow account controlled by the global tier to ensure responsible use of profits at the regional tier. The profits are released to the regional managers towards launch of new franchises. 3. Lowered barrier to entry for emerging market entrepreneurs – We are generously partnering emerged market resources directly with emerging market entrepreneurs. Although we require a start-up fee to prove skin in the game, we finance the about 90 percent of all capital needed to start a franchise. Almost any qualified entrepreneur can have the opportunity if we leverage an established brand and business model to recommend him/her to local micro finance institutions. While we are still in a nascent phase during our pilots, we are encouraged by the initial data. Even if we fail, we believe our efforts will not have been in vain – there is a future for micro-franchising. We hope that the work we do and the lessons we learn can contribute to the BoP community and improve the lives of people across the emerging world. Galen Welsch is president and co-founder of Jibu.